If you are looking for a review of all the best milk frothers in the UK, you have found the right place. We review all the latest and best milk frother models on the market, to give you peace of mind that you will be choosing the right product for your home. Below, in the table, the milk forther reviews start with the most highly rated first, then descend accordingly. For people who are in a hurry, you can use the table. For people who want a more in-depth review, you can scroll further down the page, where we provide all the pro's and con's for each. The Dualit milk frother is a compact cordless and triple function milk frother that produces hot milk, hot frothed milk and cold frothed milk in 2 minutes. It is perfect for making a latte, cappuccino, milkshakes and hot chocolates although you can still use it to simply liven up an instant coffee. The Dualit milk froth features a smart design that comprises of a patented removable whisk that uses magnetism to give a fully sealed drive. The interior is completely smooth and non-stick making it easy to clean. It has a capacity of 500ml and weighs only 1kg making it one of the most portable milk frothers on the market. Other great features of the Dualit milk frother include the patented dual speed motor, automatic switch off and the one-touch triple function. It is cordless and the bottom is fitted with non-stick rubber feet for stability on kitchen tops. The VAVA VA-EB008 Milk Frother provides you with a wide variety of milk froth options for all weather conditions. Unlike most of the milk frothers on the market, this one includes options for cool and warm in addition to the traditional hot froth option. This way, you get to enjoy your favorite coffee drinks all your round regardless of the prevailing season. 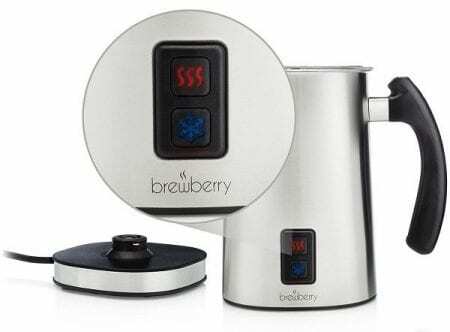 It comes with great features that enhance the coffee making experience as well as the taste of your drink. For instance, the silent, secure and smart design of the VAVA VA-EB008 Milk Frother makes it usable even in the early mornings without disrupting other people’s sleep. It also comes fitted with an internationally recognized Strix temperature controller for guaranteed safety. Other features of the VAVA VA-EB008 Milk Frother include a safe and stick-free covering, and a milk level indicator. It also comes with an extra free set of whisks. For frothing, the milk capacity should be under 115ml/3.9oz while for heating, the milk capacity is under 240ml/8.1oz. If you are looking for the perfect tool for heating, frothing and foaming milk to add to your homemade barista style coffees, then the Andrew James Electric frother and warmer is what you need. It is easy to use and it comes with great safety and convenience features. These include the 3600 base non-slip feet, cordless operation, and the automatic shutoff system. On top of that, this milk frother has a large capacity, gives an extra smooth froth and it comes with a temperature control function. It has a double-walled insulation that helps to retain the heat thus keeping the milk warm for an extended period. When using this frother, it is recommended to follow the maximum lines marked inside the jug. The lower one should be used for frothing and the upper one for heating. It has the ability to warm up to 300ml of milk to 650C in 2 minutes. For frothing, the maximum capacity is 150ml of either warm or cold milk. Bialetti’s Tutto Crema holds high the heritage of Italian passion for cooking. The frother is equipped with a double fine mesh to give you creamy and lush milk froth everytime. You can use any kind of cooker bar induction cooks to prepare your favourite froth. Being simple and practical in design, this frother can easily froth milk for 6 servings. Its design also helps for easy cleaning. The frother is made from aluminium with non-stick interiors. It is dishwasher safe, although it is recommended to be hand washed. To get the best results, fill one-third of the frother with milk and heat it to the desired temperature. Then start pumping to get frothy creamy milk for your breakfast. Are you in need of a high-end premium milk frother with dual function? Then the VonShef electric milk frother maybe what you need. It is a dual function milk frother that heats and froths a substantial portion of hot and cold milk for your barista-style coffee. It is a perfect kitchen appliance for making café-style lattes, cappuccino coffees and hot chocolates and it goes for quite a pocket-friendly price. It heats up your milk up to 650C in a matter of seconds. This milk frother is not only stylish but is also intuitively designed with a 3600 swivel base which gives it a great appearance on the kitchen worktop. Apart from that, it also features a high-quality double-walled stainless steel housing that helps to keep the milk warm and airy. The interior has a non-stick coating to provide you with a smooth functionality, easy cleaning, and simple maintenance. The package includes a wire accessory for frothing, 2 attachments, and a plastic attachment for heating. The frothing capacity for the VonShef milk frother is 115ml whereas the capacity for milk heating is 240ml. The indicator lights will notify you when your milk is ready. The Hostess Twin Frother makes frothing drinks fun. It is perfect for frothing milk, shakes and drinks. Your lattes and shakes can be prepared with the press of a button. You do not have to do much. Just put your drink in the jar and select one of the preset program buttons. The Hostess comes with 3 temperature settings. Two settings are for hot drinks and one setting is for cold drink. The 600 watt heater ensures you get instant heat for preparation while the 250 ml jar serves the drink. The jar is made of stainless steel and is dishwasher safe. This Hommitt is different in the sense that it can also be a warmer. Besides frothing milk, it can also heat milk. Both hot and cold milk can be frothed. And the best part is don’t have to be monitoring the frothing process. The device has two buttons which control 3 preset programs for processing milk. The operation is totally automatic with auto shut off and alert features. Be it frothing or heating, the process is fast. Thanks to its 500 watt motor. Now coming to the jar itself. It is made of non-stick stainless steel. This not only makes it durable but also easy to clean. The jar has maximum capacity of 240 ml which makes for one frothed serving. And to make your job that bit easier the jar is also marked for its maximum and minimum fill capacity. The Cookspace frother serves dual purpose. Not only it can froth milk but also heat it. The 550 watt heater helps in both the processes. In case of heating milk, the temperature gets locked to 65 degree Celsius. The frother has an auto switch off feature to prevent overheating and scorching. This ensures your froths are always consistent. There’s a 360 connect feature for convenient operation. The 300 ml jar is suitable for a single serving. Cleaning is no fuss as the jar is dishwasher safe. The BodumLatteo milk frother is specially designed for those people who love coffee for its rich and luscious topping. Since it only froths cold milk, its carafe is made of borosilicate glass so that you can put into the microwave to heat once frothed. This design feature is quite complementary as it indirectly gives you the option to choose between cold froth and hot froth. Also, the handle is also very easy to hold when frothing. When it comes to the ease of cleaning, the carafe and plunger are both dishwasher safe which means that post use cleanup is effortless. The other great design feature in the Bodum milk frother is the silk plastic lid. It has a deep rim which serves to prevent foam from escaping through the spout. The capacity of the milk frother is 250ml. It is black in color and it weighs approximately 340g. Bottom line, your choice of a perfect milk frother should not be too hard if you put the considerations we have shared into account. Better still, you can choose from the ones that our review covers. They include pretty much everything from the high-end premium milk frothers to the basic budget ones that are pocket-friendly. For a premium milk frother with a rich collection of features and functions, I’d recommend the Dualit milk frotherwhile for a budget milk frother that only fulfills the basic expectations, the Brewberry Electric Frother and Heater cannot disappoint. Most people will tell you that an oven or a microwave can help you create a milk froth, which is true. However, the texture, smoothness, and consistency of a milk froth created using a milk frother cannot compare to that of an oven or a microwave. Apart from that, there are other benefits that you get from using a milk frother. The first one is the ability to make several drinks. Although they are primarily used to make froth for cappuccino and latte, most of them come with additional functionalities allowing you to adjust the settings for cold froth, hot froth, and hot milk. Therefore, you can make drinks like hot chocolate, iced drinks, and lattes in addition to cappuccino. Another benefit of using a milk frother is that it is safe, convenient and easy to use. Other than the general safety cautions that you need to observe when handling electric appliances, there is no major safety caution to worry you about the milk frother. When it comes to the design, milk frothers are quite user-friendly and intuitive. They also work faster and require little maintenance not forgetting that most of them are particularly very portable. Electric milk frothers are minor kitchen appliances. Therefore, their electric load is too low to be a cause for alarm in any way. Nevertheless, it is still important to observe the necessary precautions that apply to electric appliances. For instance, you are not supposed to overload the power extension because you might trigger an electric fire. Secondly, be careful not to overfill the milk frother jug. If you do, the foam might escape through the spout or lid thus causing a mess. For most of the milk frothers that we have reviewed above and several others in the market, it is often recommended that you clean it up as soon as you are done using it. This will help keep it in tiptop condition hence enhancing its durability. Buying an electric frother can be a daunting exercise if you don’t know what to look for. Thankfully, we are here to give you the buying tips so that you don’t make the mistake of purchasing a dissatisfying brand or model. The first thing you will have to consider is the amount of froth you will be making and the frequency of making it. This is determined by the number of members in your family. However, you may be a small family but one that uses frothed milk quite often. You should get a big milk frother if you are a large family or if you will be using it quite frequently. The other factor you need to consider is whether it is handheld or electric. Handheld frothers will definitely require batteries which require regular replacements. This can be costly and annoying for some people. The ease of cleaning is another important consideration for you to make. Most handheld milk frothers are dishwasher safe. As for the automatic electric ones, most are not dishwasher safe unless if the jug is detachable from the base. Also, consider the number of functionalities you require from a milk frother. However, you should know that the more the functions the higher the price. If you are only interested in the basic functionality of a milk frother, then buying a standard milk frother is recommended as it will save you lots of money. Q: Which is better between an automatic and a manual electric milk frother? A: Considering the ease of use and the amount of effort you will need to put in, I’d say the automatic electric milk frother is better. This is because it requires zero effort from you apart from switching it on and selecting the appropriate settings. Q: What size of a milk frother should I purchase for my family? A: The size of a milk frother should be determined by the size of your family. A small family does not need a large milk frother and vice versa. Q: Is the jag dishwasher safe? A: If the milk frother is cordless and the jug is the detachable type, then you can definitely wash it in a dishwasher without any trouble.